No perplexing opening message this time, it’s the day after Karin’s birthday and so the phrase is appropriate and perfectly understandable. 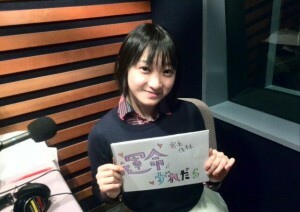 Although Yuka points out that Tomo got all 5 members of Juice into the studio for her birthday, Karin only gets Yuka. Karin sounds slightly disappointed when Yuka feels the need to bring this up, but it’s okay because they have a birthday message from a fan sent to the studio to read, yay. It’s from Pink-chan, who writes in to say that they’re going to attend her birthday event and write comments on her blog in addition to this happy birthday letter for the radio station. Karin says that she’s nervous about the birthday event because it’s in a much bigger venue, due to her sharing it with Uemu, but she hopes she can make it fun, regardless. Then they surprise her with a cake. Except it’s not a surprise because they told us it was happening on the blog last time. That’s okay, it still sounds tasty. 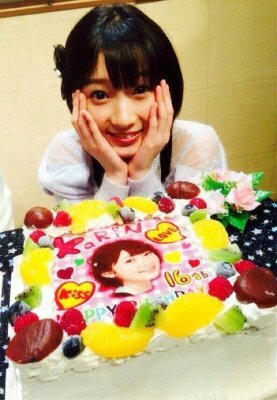 Although Karin has to share her birthday with Uemu, because she is not here at present, she gets to eat the chocolate on top all by herself, because not having all of the members present means more cake for her. She also gets to choose the first song, but I’m not so sure she had much of a choice because it’s still a Juice song, like every show. They take a break from inhaling cake to read some letters. The first letter says that they recently joined the fan club after becoming a fan of Juice, although they joined too late to be able to attend the concert in their hometown. Still, they have tickets to see their play next week and they got to go to their handshake event in Shibuya before, where they saw Karin and Uemu and were pleased by how kind both of them were. They hope that the members will accept them as part of the Juice=Juice family, and of course they do, even if there is no name and they have no idea who it was that wrote in. Oh well. Now, for an actual birthday song. Song: Country Musume ni Ishikawa Rika – Hajimete no Happy Birthday! For example, what if her mother and father did not meet right at that exact moment? She wouldn’t have been able to join Juice=Juice, she wouldn’t have been able to have the fans that she has, and everything would be different. When she initially auditioned for H!P, she actually went to the wrong station and only barely made it to audition hall, and she has no idea if she would have been able to do that without her father calming her down and supporting her. She wouldn’t be who she is now if everything hadn’t fallen into place just as it has, and she wants to thank everyone she has ever met for being there for her, as every meeting is a miracle. Happy because Karin is happy! It’s the day after her birthday, she got a cake and ate it on air, she got to do another one of her deeply philosophical voice blogs, and soon she’ll have her birthday event. All is well in Karin-land.